Oceanographers, Grant Writers, Educators, Designers, and Publicists-all members of the ELPTF- combined their talents to develop, with the Sponsorship of UCONN Sea Grant, new Educational Pamphlets that the Foundation will be making available to improve the public’s understanding and protection of the Ecosystems living on our shores. Every summer more than 100,000 individuals visit the Niantic Bay beaches between Memorial Day and Labor Day. Additionally, at least this many individuals utilize the 1.1 mile boardwalk along Niantic Bay year-round. 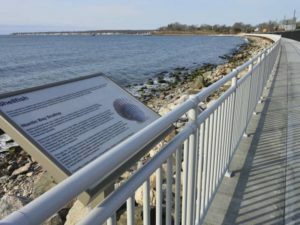 The Foundation wants to help these individuals develop a greater connection to the environment as they frequent the Niantic Bay Boardwalk, the local Niantic beaches, and the waters of Niantic Bay. This project was conceived by James Gallagher, a retired Oceanographer who began work on developing the educational pamphlets in August of 2017. He has said, “I want to provide education about key elements of the local beach environment to hopefully increase conservation, knowledge, and interest in the local ecosystem.” Mr. Gallagher and Ann Chekal, a grant writer, worked together to produce a grant proposal which was submitted to UCONN Sea Grant. In February of 2018, Sea Grant awarded the Foundation a grant of approx. $1600. Bill Rinoski, a retired science teacher, was the author of the pamphlet on Sea Shells. He not only provided the text to describe each shell, but also provided examples of the shells to the designer who produced photos for the brochure. Dr. Juliana Barrett, of UCONN Sea Grant, authored the pamphlet on Beach Plants of Niantic. Dr. Jamie Vaudrey, of the UCONN Marine Sciences Department, wrote the pamphlet on Seaweed. All the distribution sites will be near the Niantic Bay Boardwalk. Posters will mark the locations of pamphlet distribution boxes at Hole in the Wall, McCook bathhouse, Cini Park, E.L. Town Hall, E.L. Parks and Recreation Dept., E.L. High School, Niantic Center School, and the Children’s Museum. On July 2, the Foundation has scheduled a public presentation at the East Lyme Library to announce the purpose and availability of the pamphlets, beach restoration opportunities, and other potential ELPTF and Sea Grant topics. The goal of this project is to have these pamphlets assist in making the public aware of the purpose and value of the shells, plants, and seaweed as components of the local beach domain.